For the past 15 years, our efforts have been focused on the systematic characterization of genetic and epigenetic determinants for the cardiotoxicity associated with the use of specific anticancer drugs. For example, through studies in collaboration with colleagues from the Children’s Oncology group we have contributed to the identification and functional characterization of genetic variants associated to the risk of anthracycline-related cardiotoxicity in survivors of pediatric cancers. In this presentation, I will discuss our ongoing efforts with an impetus on the characterization of determinants for drug toxicity and efficacy in the context of Down syndrome (trisomy 21). 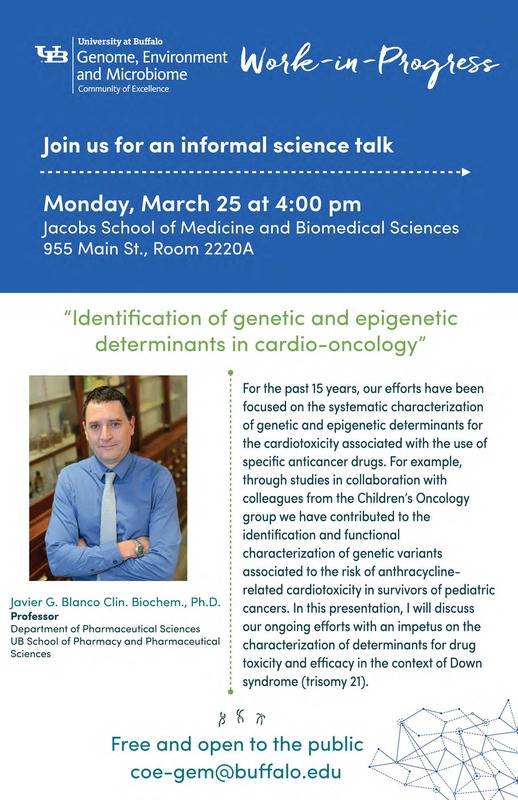 On March 25th, Dr. Javier G. Blanco from the UB School of Pharmacy and Pharmaceutical Sciences will be the speaker at the next GEM Work-in-Progress talk. These informal talks are part of the GEM Work-in-Progress series held at 4:00 p.m. on the 4th Monday of each month. 2018 talks will take place in the Jacobs School of Medine and Biomedical Sciences Building, located on UB's Downtown Campus. The speaker schedule is on the GEM website (www.buffalo.edu/gem).